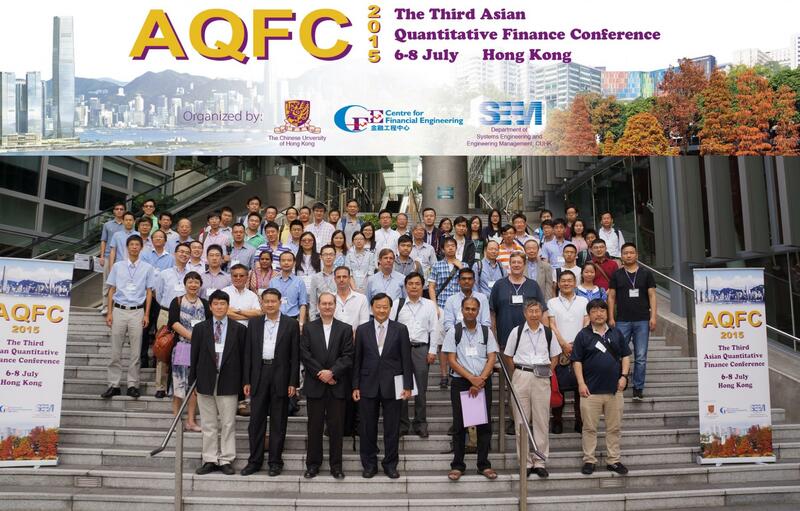 Jointly organized by the Centre for Financial Engineering (CFE) and the Department of Systems Engineering and Engineering Management, the Third Asian Quantitative Finance Conference (AQFC) was held on 6 – 8 July 2015. Prof. Benjamin W. Wah, Provost, Prof. Duan Li, Director of CFE and Prof. Nan Chen, Chair of Program Committee, AQFC, welcomed around 100 participants from academia and industry. This series of annual conferences aims to feature the latest developments in the field of quantitative finance and promote its research in Asia. It provides a platform for interaction and cooperation among researchers within Asia and elsewhere. The conference consisted of 6 keynote speeches, 48 technical presentations and a student paper competition. Many leading scholars in the area came to the event to discuss a variety of topics of current interests in quantitative finance in the post-crisis era, such as systemic risk modeling, high-frequent trading, investor behavior and finance, model uncertainty, and financial risk measurements. The 6 keynote speakers include Prof. Jerome Detemple, Boston University, Prof. Jean-Pierre Fouque, University of California, Santa Barbara, Prof. Xin Guo, University of California, Berkeley, Prof. Steven Kou, National University of Singapore, Prof. Shige Peng, Shandong University, China, and Prof. Xunyu Zhou, Oxford University. Prof. Wei Xiong from Princeton University also delivered an interesting banquet speech about demystifying the recent bubble in the Chinese housing market. Mr. Patrick Chan from Princeton University won the 1st place prize of the Best Student Paper Award. Miss Liu Xin from The Chinese University of Hong Kong and Mr. Yidong Dong from Princeton University won the 2nd place prizes.